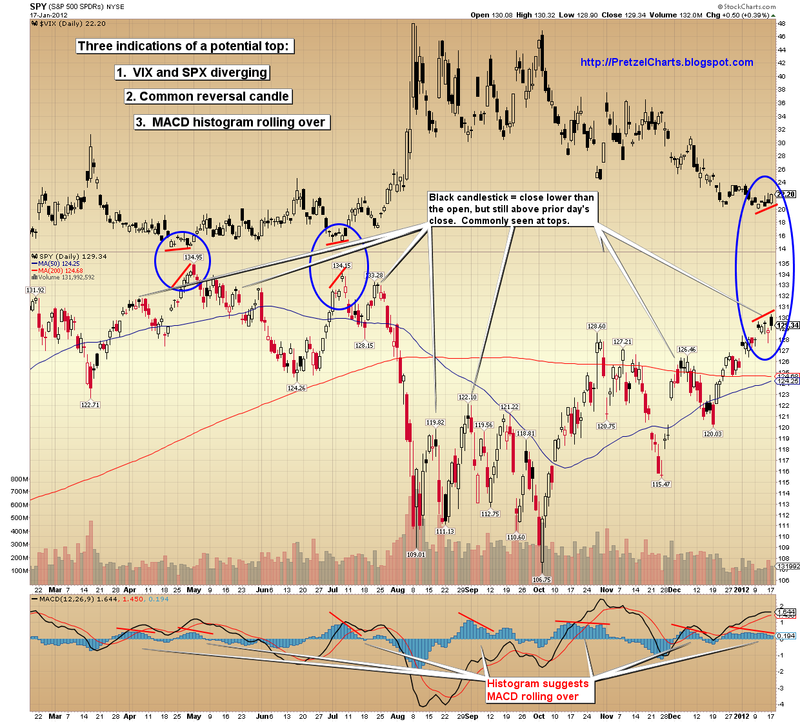 Pretzel Logic's Market Charts and Analysis: SPX Update: How Much Longer Can Europe Support the U.S. Markets? 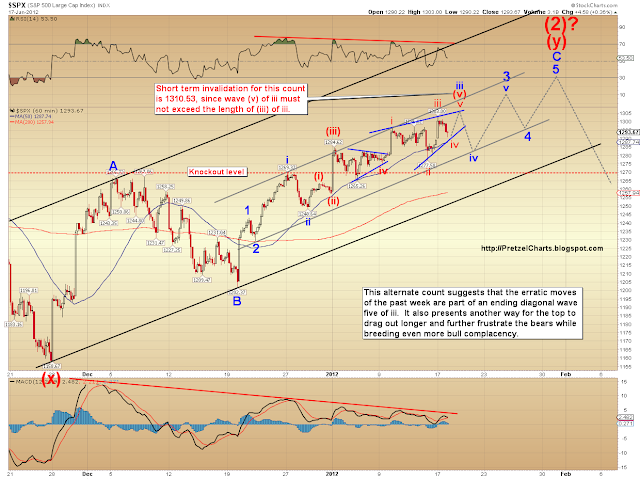 SPX Update: How Much Longer Can Europe Support the U.S. Markets? There is an unusual pattern that's developed over the past couple weeks, where the market gaps higher in the morning, then gets sold for the rest of the day. This is often a reversal pattern, but it has so far not yielded a meaningful reversal. This made me curious if this had happened before in quite this way, so I spent a good chunk of the night looking through daily charts covering the past 2,700 trading days on the S&P 500 ETF (SPY) to see if I could find a similar pattern to the current rally. Amazingly, I couldn't. Perhaps the closest analog would be April/May of 2008, but that's not exactly right either. 1) There have been huge inflows of cash into the U.S. from foreign investors who are fleeing the European system, and some of that money is finding its way into stocks. This is bullish as long as it continues, and it seems to be primarily what has driven the current rally. 2) There are large outflows from domestic mutual funds. This is bearish as long as it continues. I have an interesting speculation that perhaps the U.S. fund managers are ramping the futures each night and, effectively, distributing to the Europeans. Who knows. But it's a strange pattern nonetheless. One would think that, at some point, most of the money that's going to flee Europe will have done so already and the well will start to run dry. When that will happen is far beyond my ability to anticipate: it may have happened already (data in this regard lags the market), or it may be at some future date. My friend Lee Adler at the Wall Street Examiner does a great job tracking market liquidity, and most of my data in this regard is garnered from his Professional Report subscription service. Here are two charts from his service, which illustrate the situation. The first (on right) shows deposits into U.S. trading accounts -- based on supporting data, these are presumably coming from Europe. As Lee states in his report: "This remains a bullish influence for U.S. markets; a.k.a.- the last Ponzi game." The data is from the week ending January 4, so it lags by a couple weeks. The second chart (right) shows domestic mutual fund outflows. The most recent data here is also from the week ending 1/4/11. Weekly outflows have reached the highest levels since August. Lee states, "This continues a bearish signal on the charts... a continuation of heavy outflows could eventually take a toll on stock prices." So as of the week of January 4, the market was in a bit of a battle of liquidity inflows and outflows. Whichever source wins that battle heading forward is going to determine future market direction. I believe the European inflows simply can't last forever; and that seems to be the only thing keeping the U.S. markets afloat right now. As I stated earlier, since this data lags, a victor to this battle may have emerged already. This is why I generally use stock price charts first, and data second -- because the price charts are real-time, and should theoretically contain everything the market "knows." The short-term wave pattern could now be viewed as complete, meaning the top may be in -- however there has been nothing to confirm any sort of trend change yet. What I would really like to see is a full daily candle beneath the lower trendline to confirm a top, but the market is still a ways from that. The first chart I'd like to share is good old classical technical analysis; after that we'll look at the wave structures. The chart below highlights three factors which suggest a turn may be at hand, all noted on the chart. So there is continued evidence for a top, as there has been for roughly a week... but the market is still hovering. Some might take that as a bullish sign. Personally, unless the SPX breaks through 1300-1310 and holds it, I'm not going to get overly excited. But I've been wrong before; and the money flowing in from Europe is certainly an x-factor that bears watching at this stage. 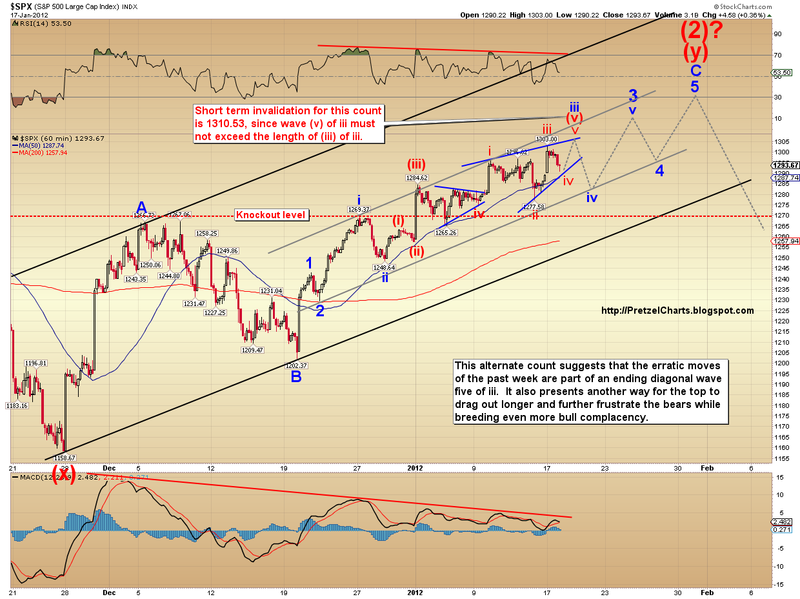 The next chart is the second chart from yesterday, which shows a potentially-complete five wave structure to a top. If this count is correct, the top is now in. It's also possible that wave five of 5 is still unfolding, with yesterday's low being four of 5. The next chart is an alternate short-term count. This count has a few things going for it, such as it effectively explains the bizarre structure of the recent rally (which looks like a series of a-b-c's). I'm keeping this count as the alternate for the time being, but market action could shift this count into the preferred role. In conclusion, unless the market breaks the key levels of 1300-1310 on the upside, and holds that break, I continue to believe that a top is close at hand, and that the market has given no real signals to become long-term bullish. At the same time, it's not yet given any concrete price signals to be short-term bearish either. There continues to be a great deal of evidence for the bear case, as outlined today and over the last week or two, but the bears need to start taking back some key levels to validate that evidence. The first level for bears to capture would be 1285 -- and then 1277 and 1270 below that. If the first count is correct, then perhaps this is the week the bears finally get 'er done. I believe the influx of European cash which has been supporting this market is (clearly) a finite source, and likely to be tracing out some type of bell curve. When that liquidity clears the apex and hits the slope, the market is going to run out of juice. Trade safe. Excellent post PL. European cash propping. Ppl lookin for the holy grail need not look when any complex top or bottom is being formed. It aint there (timewise). You can only see a top or bottom well after it is in. Give me a V move (and a beer) any time. I generally do really well at calling important bottoms -- I assume that's because the secular trend is down, so the waves are cleaner... as opposed to the corrective waves forming rallies. My top calls, while less precise, have been solid enough that one should have made money (if they protected profits during the declines). Hopefully, that track record will continue here! Well, now I'm glad I held those shorts. That was a nice little oooof-aa by the market. PRetz- with the buy spike at 5am on ES... how would characterize it? Was that a last ditch parabolic on a short time frame? Looked like a C-wave to me... and that was how I played it. ES levels ~ first break should determine direction and get us out of oscillation. Yeah, nice and unexpected. Must have been news related. Sector rotation can also explain the drop and pop. Furthermore, the European banks are sitting on a ginormous pile of Euro's that Super Mario printed for them. They are not about to jump into the sovereign bond market until they have some assurance that they have a backstop. That is a lot of dry powder. Looks like long term TIC flows confirm your analysis this morning. Up 59.8 Billion. morning guys. lets see what the market has for us today. ps pretz, i saw you mentioned on another blog i read. nice! I was thinking below 1288 and we are headed to 1265 to close the gap from the 3rd. Below 1286 will just give me more confidence. I appreciate that you post your intraday targets Katz! It gives me something to check my own ideas against. Will consider going short again if the triple-bottom falls apart, or shorting again higher. Capacity utilization rose to near 80%. US manufacturing rose 0.9%. Surely but slowly, US manufacturing is coming back. Housing is the key rocket fuel, however. In an interview, Atlanta's Fed president said that he and his colleagues had no reservation about authorizing the Fed Chairman to hit the QE 3 button. He added that it might be housing targeted. So far, the earning season is new. Euro popped on larger than expected IMF war chest. Why do people even listen to this Synthetic QE3 chatter anymore? The Fed has been threatening QE3 for months. If they didn't do it when the market was much lower, and the news was much worse, why on earth would you think they would do it now? They don't want $150/bbl oil, believe me. That will kill whatever recovery is going. Besides that, there's just NO reason for it here. They need to save this bullet for something serious -- not waste it when the market's in an uptrend and the data looks nothing like a "crisis." SPX so far ahead of Euro now, I don't think those pops will matter for a while. Damn, bounced right of my ES 1286.
yeah...my first ever currency trade was working...until more intervention ran my stop. EXCELLENT POST PL!!! I don't know how you pull it off everyday. Especially with BSers like me haranguing you in the middle of the night. You are a really extraordinary person. I'm starting to get it now (I just wish my Prechter book would arrive. )....And Katzy...you're the bomb too, as well as all of the other seasoned vets...way better than any college course I ever had. Thanks to all. I was thinking about you when he posted that. Many of the unemployed are long-term, the Fed Chairman had said many times that it was an American crisis. Well, I only looked at the last 2,700 trading days -- not all of history. And I was looking for a specific thing, as stated. And I wasn't just looking at tops! I was looking at the whole market -- tops/bottoms/in-betweens. But regarding what I was looking for, I didn't see anything exactly like it. btw, if you sign up w/ Lee, if you would, do it through my link so he knows I'm sending him some bidness. I owe him for the intro to some people, so I'd like him to see I'm trying to pay him back by sending him some bidness. It's a damn good service, and he really should be charging WAY more than he does, IMO. vanishing trader. More unsettling evidence about one cause for January's limp volume. Thnx for the compliment jbg. Feel free to ask questions, I had an excellent teacher and finished my education with Atilla. And I am continuing to learn from Pretzel. Basically I am just an EW and TA chartist, do not watch the news or any thing else. Still think it is all in the charts first (as I know Pretzel does). I will definitely send him bidness through your link...He is completely driven, thorough, and competent. Both your and his work would never be available to any of the little guys like me without the internet...I was gonna give a shout out to Algore, but didn't want erasers thrown at me. Thanks again. CORRECTION on down below: this is the third test of the 1286 ES level. This steep rise (look at a 5 min. chart) and this test fact does not prove me much confidence for an immediate continued down. But you may have your facts wrong: I'm pretty sure Anon20 invented the internet. Algore stole it from him! They're idiots if they believe inlfation is tame. CPI is the most manipulated piece of crap data point out there. Right. That top is totally different than what I was looking at. I don't mean to say it's different in ALL aspects -- it's just different than what I was looking at. Look at all the gaps up followed by black candlesticks and reversal candlesticks... followed by more gaps up and black or reversal candlesticks -- that's what I was looking for. A series like this one -- and there wasn't any, going back to 2000 or so. Thank *You*. As soon as I snuggle up with a book or two, then I'll know which questions to ask. In the meantime, I'm just thoroughly enjoying your chartporn. It's awesome. I'm convinced (when wearing my criminal cap) that the MMs really want this puppy closer to 1310 and then short the poop out of it. That would be chartable within reason. Their main enemy is time and they're running out of it (purely gut on this). It is now testing my upper limit of ES 1296. Once again...ROFLMAO...This is getting to be almost as fun as being an ER nurse....oops...peezed myself again. I am not a believer in "cash on the sidelines." Every transaction has both a buyer and a seller, therefore, it's a zero sum game. If a hedgefund takes $20 million and buys stocks with it, now the guy who sold it to them has $20 million of "cash on the sidelines." When he spends it, same thing happens. Rinse and repeat. So, IMO, "cash on the sidelines" is a big myth. U.S. market money is just changing hands. What keeps the market hovering is the influx of *new* money, i.e.- fresh liquidity that hasn't been circulated before... such as money flowing out of European markets and into U.S. markets. Or money printed in QE. Then it becomes a different game. Just MHO. Yeah true, agree, but question is when? As they say one can get the levels right or the timing correct but not both (rarely). its true. i was there! dont forget about the wheel and sliced bread too. 1297, out of those shorts? how tight do you normally set stops? Haven't even been looking at the market. Got booted out of this position for -2. Oh well, it's been a good night, so I'm happy to sit in cash here for a bit. Usually pretty tight. 1--3 points... just depends on how it's acting. Occasionally, I'll give a trade more room. But not when I'm just taking a stab. Hi Pretzel, I wonder if this almost "highlander style" immortal rally has anything to do with the Chinese Lunar New Year coming up next Monday and Tuesday. It so happens that the New Year is "the year of the dragon". Chinese believe that Dragon years are the best/mightiest years in the 12 year zodiac cycle. This came to mind when my colleague casually commented "that we are going to get a recession in the Dragon year" late in December. Interesting point, never thought of it that way. New cash (scukers) coming in from Europe as you stated? Best guess would be that it puts in *some* type of top between here and 520. Much above 520 and something else going on. Honestly waiting for the market to turn before I worry too much about stocks like PCLN again, so I haven't been watching it religiously lately. That's my thinking at present. This is one heck of a show to watch right now, the alternate count got within 1/2 point of being put into play so far. There is no question that America shot herself in the foot. The US style of capitalism aided and abetted the hollowing out of America. At this point, I am urging my children to learn Chinese and Arabic. Now ya went and did it! Mrkt is involved in an ST or IT oscillation. Stochastics work very well when mrkt is in oscillation mode. What I do is to search for a time frame that shows the full extent of an oscillation move , or stochastics moving smoothly (somewhat) from top to bottom and up again. The 10 ES does this. "This will work until the last cycle, then it will screw you...."
Not even a kiss afterwards...been there, done that. Lol- where were you guys on this one? I get to doing too many things at once sometimes. There's no invalidation level for the second count. Wave (iii) is already longer than wave (i). I was looking at another count before that one, and I mistakingly transposed by numbers onto the new count. How about ADX. It seems to work better than stochastics in that it is more absolute. No? 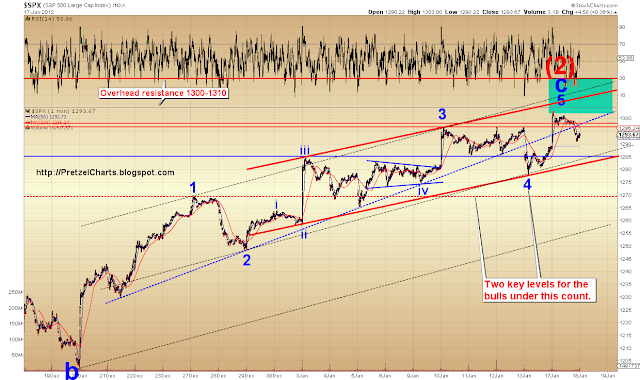 This is interesting, too -- because with where the bounce started, this could still be wave 5 of 5 on the first count. Going long on Mandarin :) The Arabs, not so much. Maybe that will change. This is where I seriously just run out of time. I literally worked non-stop on this update for about 11 hours -- but I can kick back now and can do the "editor" thing. I need a team of Elliotticians and an editor. Then I can just bark orders at them and have them bring me Lattes. Ya need to use more colors, or different characters to keep you straight...Definitely more colors, even though it bring down StockChart servers. do tops occur while walking resistance lines like this or is it more common to tag and drop? Tops are very rarely inverted v's. Usually, they look like this market. Several stabs at a new high that fail, then a last retest of the final failure... then a drop. "How will playing cards help?" Let me look into that, if I have it. I see it now, it is a megaphone on the 10 min ES chart. Very interesting. Megaphones shake out the weak players by stripping them of cash before the next major move. PL hasn't gone to bed yet. I think that's a bearish indicator: He thinks the top is near and he's here to watch as it happens!
. sold shorts or whatever the term is, sqeezed. just played big longto bail me out i need 1320 and will sell her there. this trend is up so that the play i thinks. "With Sun square Saturn next week on 1/19, I fully expect a reversal +/- a day or so from Wed-Thurs." Anything more to add from the stars? Yep, don't know where you would be if I hadn't noticed that one typo. Probably sleeping under a bridge somewhere I reckon. Akwfung, from what you've heard, would QE3 expand the Fed's balance sheet? Or just remix assets? Billabuster, what are you playing and where is your entry. Trying to help you out. What charting do you use? TIA. Very hard to learn the language well enough to pick up the multiple entendres. Would have to be a native speaker for the agencies to have a real interest in you, imo. What is the significance of the fact the NASDAQ Composite finally made a new record high since last October. The NASDAQ has been lagging in that regard compared to DOW and SPX. didnt hit yesterdays high... yet? It's there. Play it, PL. I fully expect a reversal here by Friday- question is, is it short term - (meaning a few days) or long term. For all of you that are day trading these moves, be aware that the moon moves into Sagittarius at 2:29 EST and may provide energy for a boost up toward the close. BTW - both France and Spain have bond auctions tomorrow. The Spanish bonds will be most interesting since they are 5 yr and 10 yr. 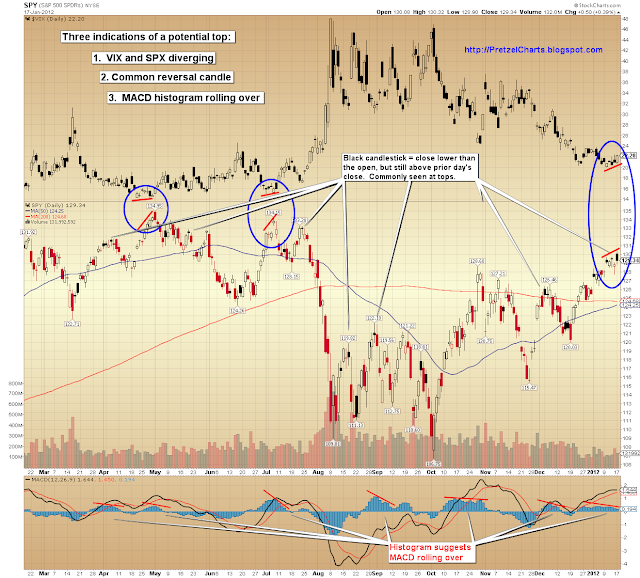 Here is a visual of the megaphone and some entry/exit points marked in yellow on the stochs. Candle action will extend from one line to the other usually. That is, until it does not work anymore and a true direction appears, which will screw anyone who did not read the mrkt correctly. This is a megaphone or expanded triangle. I always try to follow up on previous charts & commentary. See the red TL from this morn? Eagan Jones downgraded Germany to AA- from AA. Hello board. I have the NDX breaking thru 2412 and now it appears 2438 is the next stop this week. I have tried to post a chart of my count but I am all thumbs apparently. This is a rare month for the NDX. An open after the last OPEX of 2215 and now a trading range of 200 straight up since Dec 20. It appears something will give in a big way soon. Just not sure it is this week. Any ideas on this index? I will try to post a chart again. shorted ES @ 1299.5 w stop at 1301.25. If you saw at my post below you'd have won at least 3.5 pts on this current move. Just be on the right side... Wait a bit for there may be a pull back then there may be more to come but be focus and make your decision. MYSELF, I am starting to think that the great economist Irving Fisher had it right back oct. 1929, 3 days before the GSC3 crash, when he proudly said publicly: "stock prices have reached what looks like a permanently high plateau." This market is a zombie dracula, for no matter how many wood stakes I drive in it, it stumbles back up, every day. Dollar index backed up a little bit once again to around 81, gold and silver want to die but still refuse to. whatever. but this is a fundamentally zombie market, of that I am CERTAIN, and it is already DEAD, but does not know it yet. because, central banker dr. caligari's give this usa spx golem a european virgin's blood every night, keeps him hard. that country by country, have overspent multiples of what they earned? How long, before eu runs out of virgins? Few eu virgins left to sacrifice, IMO, for the eu hags' 50yr. of excesses. And I also read an article yesterday, of record market withdrawals. is a MAJOR gap down, overnight, and NOT a slow trickle down. where battle will then again be staged, for at least a few days. and I predict nearly NONE of you will be aboard, to ride it. interesting, what are the implications for this? retrace back to 1285, but which way is it suppose to breakout? Anon20, thanks for this take on the situation. I'll be there. I'm massively short, from two weeks too early, and hurting, but waiting for revenge, a dish best served cold. I am with you as well. I too shorted way too early and have been holding and waiting for the top and drop. Thanks for the posts Annon20. Please keep them coming. dle7319, do you trade futures or the cash market or individual stocks? Thanks Anon...My top for RUT is 780. Then I will likely short this creature. I say we are now on (v) of iii in PL's Alt Count chart of today. Seconds? Implications are that it will work its way up and down til it tires and goes the correct direction (down me thinks). It is an exhaustive phase, robbing both sides. dont need helpfrom u. thats my problem following ppl . i saw up from 1260 and didnt play what i saw. That looks like it to upside, trade your low charts tho. 1305 could of been the end of it. It counted as a 5 of 5 of 5 of c of 2 of c. Slight 5th wave overthrow of the upper wedge trendline, bear exuberance everywhere, in the middle of major resistance, super stretched divergences. I cannot think of a better place to call a top then right here. I do see one other alternative (if this is a wave 2), and that is we just finished 3 up of c. We will get a correction down to the lower wedge trend line around 1260 and another move up for a 5th wave. LOL, don't take my word for it though, I am in pain from bad calls for the last month. Rut ohhh, I faint at needles. I picked a bad time to become a short and hold trader a few weeks ago. akwfung, I think PL is the best of this stuff... Trust him. Double top on the 120/240, that will attempt to shake every short out. Could still be v of 5 of C of (2) on the first chart by my count. Since you have been unemotionally correct for a few weeks, I will answer you. what does 1340spx relate to, in dow industrials, a break above prior 2011 high, right? well, I will tell you, IF dji breaks above prior 2011 high, even intraday, I will admit bull market. so, since you have been correct so far in 2012, I will say, if spx goes to 1340, then, bull market. I rate odds at less that a 1000 to 1, but hey, I was also sure MY 1255spx trendline would hold. So, how far can idiots go, how stupid, linear, moronic, imbecilic, can modern empty amerikans be? you tell ME. you are one of them. I just want to double check and get oriented before jumping in. See this little pop right after I said it was all down, happens often. Exhaustive ending spike if that is what it is I think, will know in an 1/2 hour or so, and is purposeful to reset the stochs back to the top. Let us see. You can tell them as the dont quite come up to the previous high on small time frames. They are really a failed attempt to go higher, or a failed 5. Yeah, me too, since October. Over 400 failed trades. But no more, from now on I'm going long and buying the dips! i am ready; i placed a march spy put at 130! let's see how much that one will be in the money by then! first mouse gets the squeeze, 2nd gets the cheese! i see the chart from sept 2010, and it had this exact same channel setup that went on for 4 MONTHS. just steady march upward, almost no spikes. Yesterday, I thought the sucker would go up and may be retest 1300 before coming back down. I though it might be safer to ride it down instead of trying to follow my up call. He is pretty good...TA and intraday swings. reversal on the breakout needs downside follow through. I think we are heading for the ultimate pain zone for those holding shorts... like me. LOL. It went down because of a little glich at 1291.25 ES (as I told everyone) but the momentum pull it down lower. Here is another factor - momentum. That's why it's very dynamic. Has PLs preferred count be eliminated yet? Could this not till be a wave 5 of 5? What glitch are you talking about? Re-opened small short position at 1301.25 after getting stopped out. Still looks stretched to the upside to me. It would be nice to have a break out, to the downside, of this 'diagonal' to end the day. But I think any break down will be short lived. I believe that the consequences of money printing and false economic growth need to start showing up in company earnings and lower consumer spending and lower GDP numbers before we see a real break. The central banks and governments have rigged the game and will do whatever it takes to keep the patient alive... even if it means that the final fixes will be that much more painful. A sell order at around 3:00 pm. melt up- hopefully enough of a run up to kill off all short stops. we need capitulation, not a slow drift up. Are you daily trader or short term trader? Don't make a decision like that. It's dangerous. Don't be emotional. It won't work. It can be changed tomorrow. You need to open your mind to perceive what the market telling you and act on it. we got the new high. any updates from cobra? Symmetry on the SPY since 12:30PM indicates a potential fast move could begin around 3:30PM. Wow... even pushing above diagonal top trend line. Could this be the start of the final leg to the ultimate pain zone? No, I think he is also expecting a top somewhere in here. Wedge forming, gotta break at some point right? I think it closes down from here. That's because pronouncements such as these are stated in terms of years. Lagarde doesn't say things like, the banks' credit will freeze next week. read these posts- EVERYONE is STILL short. they ALL have to capitulate before we can turn. MORE CAPS!!! But there is always the possibility that the push up was to entice the longs and tomorrow we open back down. I think they (you know, them) want to still pull in more longs and squeeze some more shorts so we will still see another week or so of the upward movement. They may hold these levels or push higher up until right before / after AAPL earnings which are scheduled after next Tuesday's close. hope springs eternal. Stops are in, emotions are out. Wow. We are pinned right here.